We all unwillingly carry a piece of the conflict in eastern Congo in our consumer electronics products, but we can use this connection as leverage to help change the situation. This holiday shopping season is an opportunity to raise awareness about the conflict and our connection to it. More importantly, we can highlight what we are doing to bring peace to the region. Below is a Letter to the Editor, written by Carly Oboth, a leader in the student Conflict-Free Campus Initiative at American University, which explains all of our unique link to the conflict and what she is doing to make sure her campus is not fueling violence in eastern Congo. Take a look at Carly’s piece for inspiration to write a Letter to the Editor for your school newspaper! And be sure to let us know if it gets published. It’s that time of year. The time to be thankful, be merry, decorate, celebrate, and most of all, to buy presents for friends and family. On Black Friday of this year, stores opened at midnight to feed our desire for the latest laptops, cell phones, computers, and new tech gear at discounted prices. It happens every year; it’s a tradition. What most shoppers do not realize, is that half a world away, our demand for the newest electronic products is funding one of the deadliest conflicts this world has ever seen. In the Democratic Republic of Congo, Africa’s largest and most impoverished country, an estimated 5.4 million people have died since 1998 due to fighting between armed groups and the government, and millions more have been displaced from their homes. Deemed the most dangerous place in the world to be a woman, over 15,000 cases of sexual violence were reported in 2010 alone, over half of which were children. Even worse, thousands more remain unreported. As consumers of electronic devices, we are complicit in this humanitarian crisis, and we carry a piece of this raging conflict in our pockets. Minerals such as tin, tungsten, tantalum, and gold—conflict minerals—are used in the production and function of electronic products including cellular phones, mp3 players, game systems, laptops and more. The multimillion dollar trade in these conflict minerals provides funding for the militias and military units operating in eastern Congo that continue to fight, terrorize populations, and commit heinous human rights atrocities to control the mines. This holiday season, let’s remember the human cost of these prized electronic products. The direct link between the consumer products we use every day and the war in Congo gives us enormous power to demand change. While we are not able to purchase conflict-free products yet, we can join the conflict-free movement to put pressure on electronics companies and the US Government to clean up the minerals trade in Congo and create a certification process, like that for conflict diamonds in West Africa. As a student at American University, I am spearheading the Conflict Free Campus Initiative, which seeks to change the way my University does business and alter our purchasing policy to favor conflict-free products. 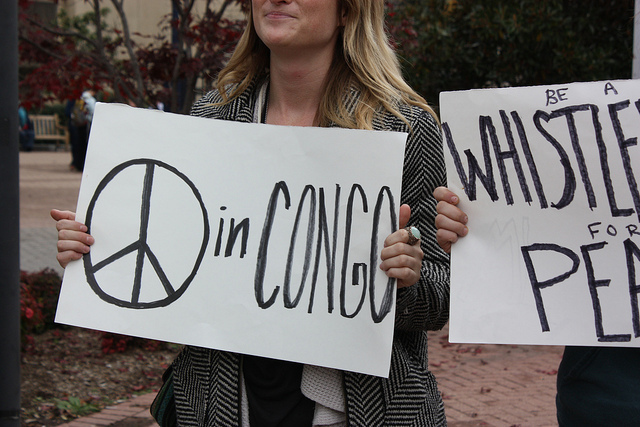 As a student, I want my tuition dollars to be used to benefit our community—both local and global, not the conflict in the Congo. We cannot afford to sit by and watch as the violence continues. Visit www.raisehopeforcongo.org to learn more about how you can join the conflict-free movement. If you are a student, contact Carly Oboth at carlyoboth[at]gmail.com to learn how you can bring the Conflict-Free Campus Initiative to your campus.